Mr Hemingway took over the mayoralty for the term 1938-1941 between Mr Ramsbottom‘s two periods of office. Apart from this he was not on the Borough Council, however like Mr Ramsbottom his activities for the locality were numerous and covered many interests. Apart from his profession of printer he was widely known for his education work primarily as Chairman of the Wanganui Education Board. Hemingway was born in Jametz, France. His father was an Imperial Army captain who had seen service in the Crimean and Indian wars, and in New Zealand in Taranaki under General Cameron. This was perhaps why Edward, although winning a Sutton Valence scholarship to Keeble College, Oxford, decided instead to come to this area in 1892. He was shortly joined by his father, sister and two brothers, one of these being W. H. Hemingway who set up the Hemingway Correspondence School. After some farming and office work in Stratford he took up teaching at Purangi for a year but returned to Stratford and instead of pursuing teaching studies re-sumed office work and became Town Clerk from 1902 to 1911. After that he started on his main career as editor and proprietor of the Patea and Waverley Press from 1911 until 1941, when the paper went into recess. He continued with job printing till 1946 when the business was sold to E. W. Beckett. 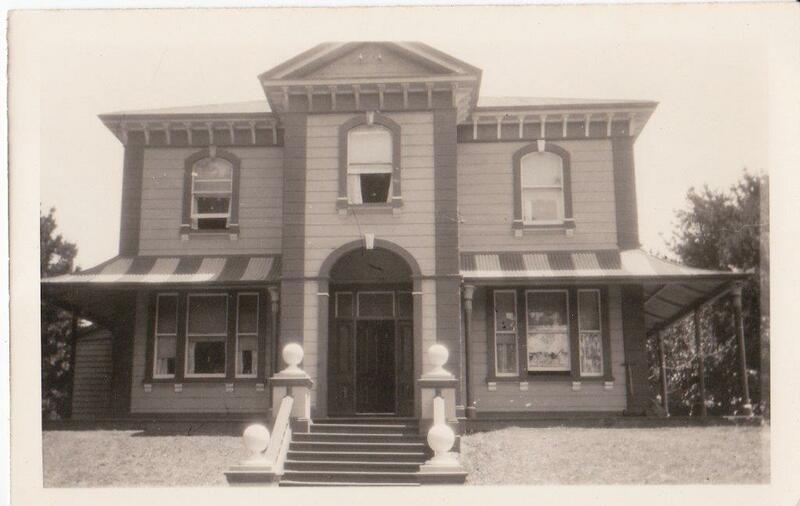 The Hemingway's owned the stately big home on the hill 'Beconsfield' at the end of Lincoln Street from 1917 -1941. He had married the daughter of Mr and Mrs Fletcher Dixon of Stratford in 1901, Eva, and they had a family of four daughters. Their 13 year old daughter Joyce was drowned in 1918, swimming in the Patea River. 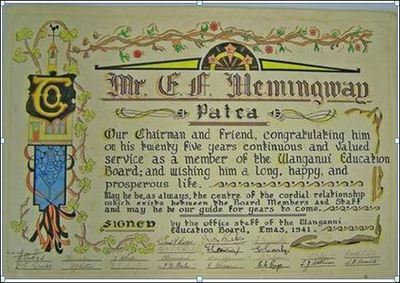 This tragedy inspired Mr Hemingway to take steps to see children learned to swim and he and his brother provided funds for the Patea Primary School Baths which opened in 1922. Also while he was mayor he was associated with the provision of the swimming pool at the Patea Beach as the Centennial Memorial. 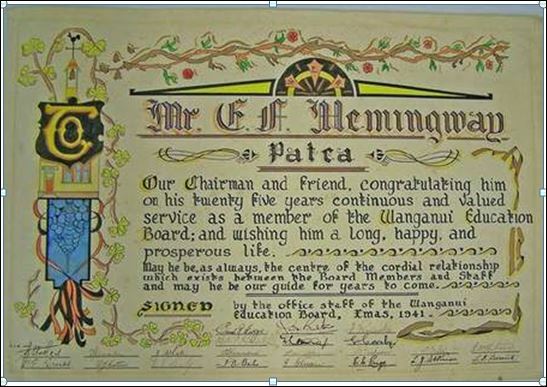 In his position as Chairman of the Patea Domain Board which he held for 20 years, he was largely responsible for the Hunter Shaw Memorial Play Ground. It was his suggestion to the Hunter Shaw executors that $2600 of the bequest could be used for this. He became a member of the Wanganui Education Board in 1916 and was elected chairman in 1933 which position he still held at the time of his death. He made a point of personal contact with all schools in his area and had strong opinions on character training and the place of religion in life. He was an active member of many organisations, being president, chairman or patron of most at some time. These included the local sub-centre of the Red Cross, Wanganui Society for the Prevention of Cruelty to Animals, School Children‘s Garden Circle, South Taranaki Crippled Children’s Society Advisory Board, Patea and District Plunket Society and Patea and District Primary Schools’ Amateur Athletic Association. He was also active in the local Anglican Church being a lay reader for 45 years. He was senior J.P. of the town and District Coroner. He was president of St John’s Ambulance Brigade and took an influential part in organising treatment during 1919 in the influenza epidemic, mobilising hospital staff and pro-gramming preventive measures. He was interested in sports in general and helped the Boating Club acquire a boathouse (the old Alton Schoolhouse) and had a keen interest in cricket and captained the Stratford team for many years in his early days. He was Dominion Vice President of the Navy League and his interest in politics led him to draft an organisational scheme used by the National Party in the ‘40s. Altogether he was an extremely busy and public spirited man. He died at age 74 in 1947 and is buried beside his wife Eva at the Patea Cemetery. She died in 1961 aged 91.